the development and real field validation of a complete SKG scheme based on the Channel State Information (CSI). 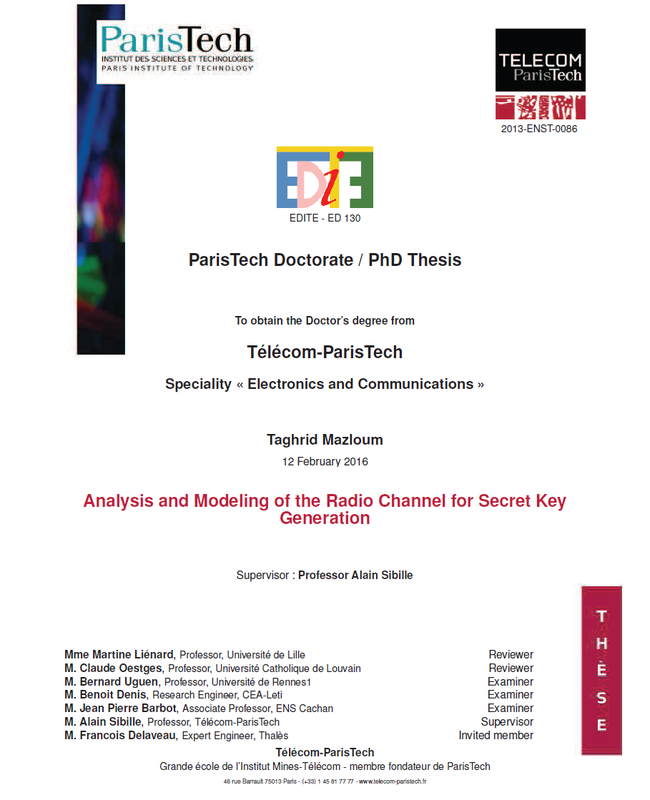 The defense of PhD Thesis of Mrs. Taghrid Mazloum took place on January 12, 2016, in Telecom ParisTech premises, in front of 6 jury members specialized in physical layer security and radio channels. The whole Phylaws team congratulates Taghrid Mazloum for her success, the added value of her results and her amazing presentation. In the framework of the Phylaws project (WP3), Mr Hamed Mirghasemi performed a PhD thesis about Lattice Codes for the Continuous Wiretap Channels. The defense of PhD Thesis of Mr. Hamed Mirghasemi took place on October 10, 2014, in Telecom ParisTech premises, in front of 7 jury members specialized in physical layer security and channel coding. The outcome and defense report were considered excellent by the committee. The whole Phylaws team congratulates Hamed Mirghasemi for his success, the added value of his results and his deepful presentation. PhyLaws is a FP7 project. For contact, use contact page.